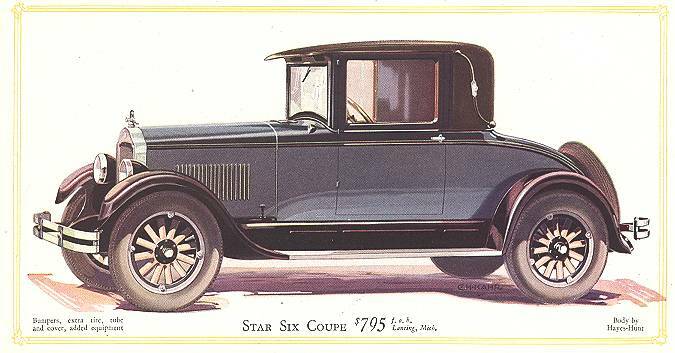 GRACEFUL, low, blending stream lines; a brilliantly nickeled, artistically modeled radiator; sweeping, lustrous, black crown fenders and highly polished body finishes in handsome shades of lacquer give Star Cars distinguished individuality and style. Interior finish and appointments are fully in keeping with their superb exterior. Heavily padded, deeply cushioned upholstery in pleasing colors; indirectly illuminated instruments conveniently clustered on neatly designed instrument boards; exclusive Hayes-Hunt comfort-inducing visor ventilators on closed models; handsome American walnut finish trim in all six-cylinder closed models and numerous other refinements create a decided atmosphere of coziness, comfort and beauty. 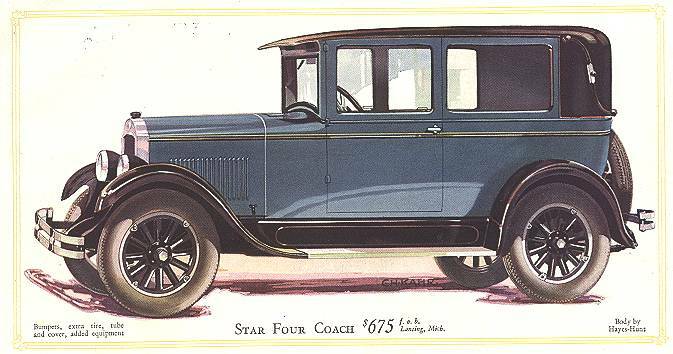 The Star chassis, no less than Hayes-Hunt bodies, establish new standards of quality among low-priced automobiles. 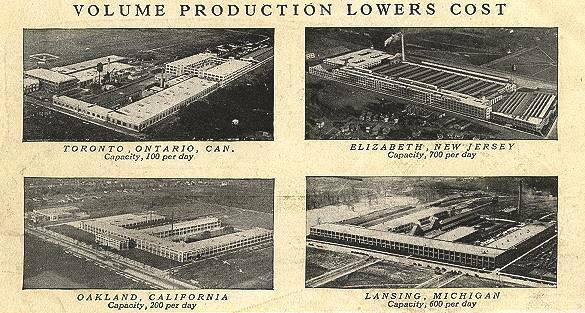 Their commanding position in the low-priced automobile field is due to such mechanical features as full force-feed motor lubrication; honed cylinder walls; Nelson strut light-weight pistons; lapped piston pins; mirror-finished motor bearings; perfectly balanced crank shafts; hot spot manifold; silent front end chain drive; removable valve and valve tappet guides; shock absorbing, cushion ball universal joint; quick action brakes; six heavy frame cross members; superior pump driven cooling system; heavy, single-plate, dry disc clutch; straight line power drive; semi-irreversible, easy steering mechanism and flexible, shock-absorbing springs. 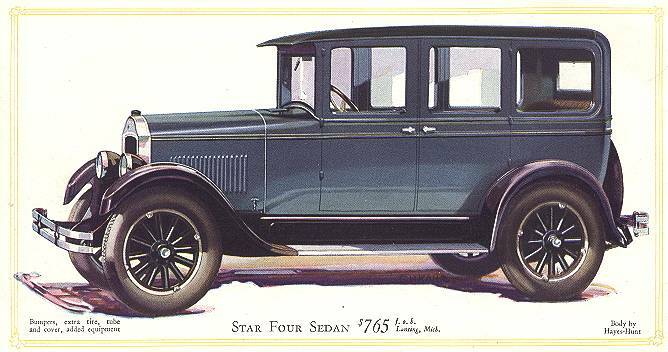 The appearance, comfort, power, safety, and economy of Star Cars have justly won for them quality and style leadership in their price class. COMFORT, looks, economy, are magic words, but power leads them all. We like to feel power when we step on it; to show the tail light on the hills. The power and flexibility of the Star Car are amazing. There is a snap to the getaway that puts you quickly in front of traffic. You sweep up hills ahead of the laggard and drive at sustained speed., You throttle down to a snail's pace-four, three, even two miles an hour, and glide smoothly forward without shifting gears. Quick acceleration, superlative power, unusual speed are qualities that give the Star Car its reputation for power supremacy. Within its price class, the Star Car has no equal in power. It is the undefeated champion of the hills. Through gumbo and marshland, shifting sands and drifting snows, ruts and underbrush, up mountain grades and through the valleys, the Star Car wends its way, no hill too steep, no mud too deep, reliable in performance under the most trying conditions. It pays to drive a powerful car. , It pays because the automobile owner has learned that a powerful car usually has all -the other virtues that make motoring a delight. Ask for proof of Star power supremacy. Any Star Car dealer will gladly demonstrate the power of the Star Car without the slightest obligation on your part. Ask for a demonstration. Make us prove our claim. A MOTOR smooth beyond comparison. These five words best describe the operation of the Star Four power plant. To Star power supremacy is now added motor performance of a quality unequaled in the history of four-cylinder automotive transportation. A silent, velvet-smooth flow of power at all high-gear driving speeds, ranging from fifteen to fifty miles an hour. Equally silent and smooth motor action in first and second gears at all speeds. On each side of the front motor arm of the Star Four motor and on the two rear motor supports are rubber cushions, four in all. On these rubber cushions the Star Four motor is mounted. The result of rubber cushioning the engine is a revolution in motor performances continuously smooth, even, quiet flow of power never before achieved. Again we say a motor smooth beyond comparison. 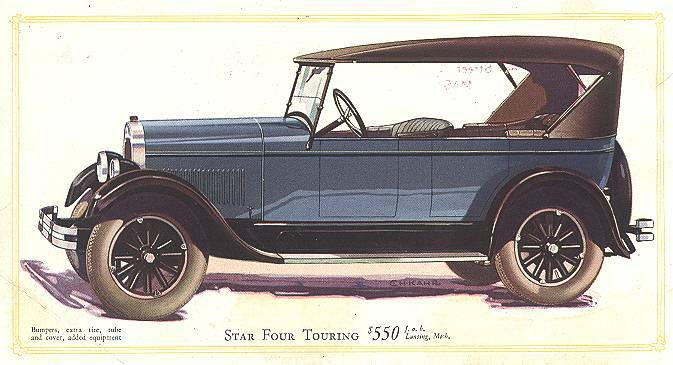 The Star Four is the first low priced four-cylinder automobile to adopt this epoch-making engineering achievement. 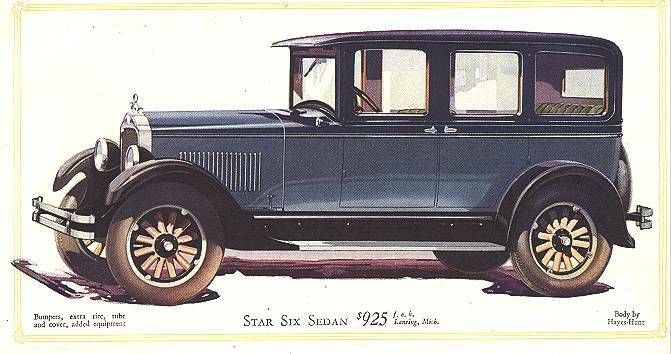 It is another manifestation of the avowed policy of Durant Motors to maintain Star Cars in a position of quality leadership among low-priced automobiles. MOTOR: Four-cylinder, L-Head type, detachable head; bore, 3 3/8 "; stroke, 4 ¼ "; piston displacement, 152 cubic inches. CYLINDERS: Cast en bloc with upper half of crankcase; detachable head. VALVES: 1 ½ " diameter; 5-16" lift. CRANKSHAFT BEARINGS: Front, l ½ " x 1 25-32"; center, 1 ½" x 1 9-16"; rear, l ½ x 2 ¾ ". CAMSHAFT BEARINGS: Front, l ¾ " x 1 3-8"; center, l 5/8" x 1"; rear, l ½ x 1 33-64". .
MOTOR LUBRICATION: Force-feed to. all camshaft, main and connecting rod, bearings. COOLING SYSTEM: Honeycomb type radiator; capacity, 8 quarts; 16" fan, 4 blades; pump. FRONT AXLE: Standard drop-forged "I" beam section with reverse Elliott type steering mechanism, Taper roller wheel bearings. REAR AXLE: Semi-floating, simple design, with spiral bevel ring gear and pinion. BRAKES: External contracting, internal expanding; 11" brake drum. Easy adjustment. SPRINGS: Semi-elliptic; front, 35 7/8"; rear, 53 ¾". TIRES: Open models, 30" x 3 ½", non-skid clincher cord; closed models, 29"x 4.40 balloon. CARBURETOR: One-inch, plain tube, air and fuel adjustment. Exhaust, and intake manifold with hot spot, mounted on left side of engine. CLUTCH: Single plate, dry disc, enclosed in flywheel; separately removable. TRANSMISSION: Standard, selective sliding gear type, three speeds forward and one reverse. STEERING GEAR: Semi-irreversible, worm and gear type. Ball thrust bearings; 16" wheel. CONTROLS: Center control; accelerator pedal on toe board. Spark and throttle levers on steering wheel,. Speedometer, ammeter, oil gauge, and instrument lamp clustered on instrument board. Choke, ignition and lighting switch mounted on instrument board. STARTING, LIGHTING, IGNITION: Generator, starting motor, igniter, coil, motor horn. GASOLINE SUPPLY: Capacity of tank, 11 ½ gallons placed at rear. Vacuum feed. Manufacturer reserves the right to make changes in design and specifications without notice. 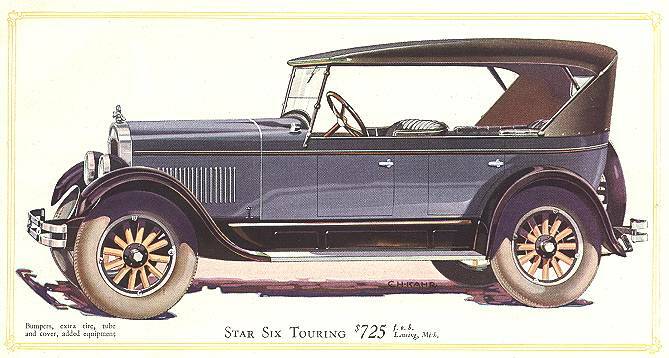 THE Star Six Touring is the world's lowest priced six-cylinder automobile. It sells for considerably less than any other six-cylinder touring car. 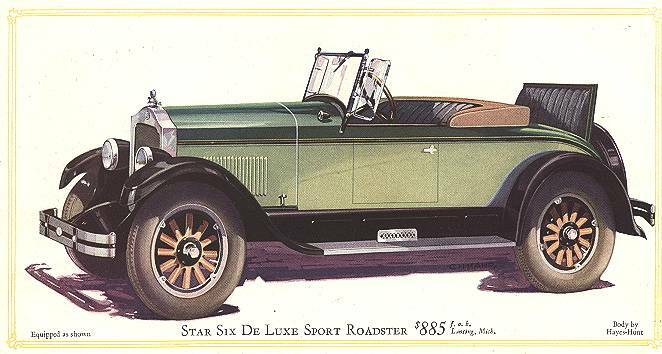 The Star Six De Luxe Sport Roadster and the Star Six Cabriolet are the world's lowest priced cars of their type. They provide the style, power, speed, special equipment, embellishments and comfort expected in these types of cars and at prices below all competition. 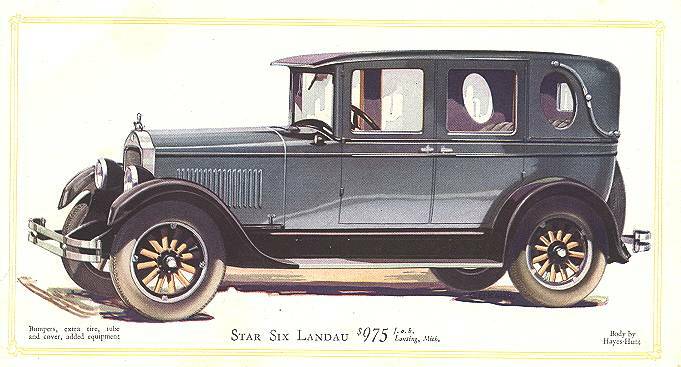 The Star Six Coach, Sedan, Landau and Coupe, quality considered, represent the greatest values in their types of low-priced, six-cylinder cars. The Star Six line offers the world's widest choice of models made by a single manufacturer that provide high-quality, low-cost, six-cylinder transportation. 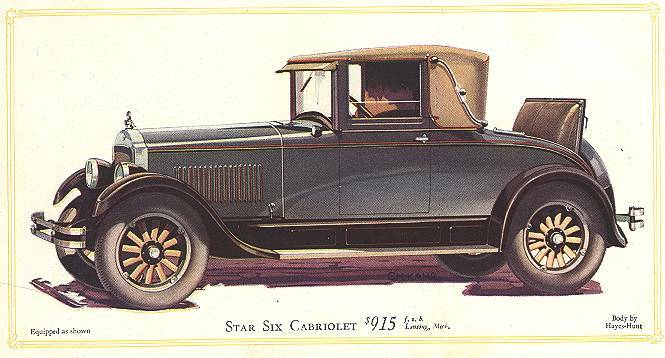 Star Sixes are the world's most handsome six cylinder automobiles listing at less than $1,000. 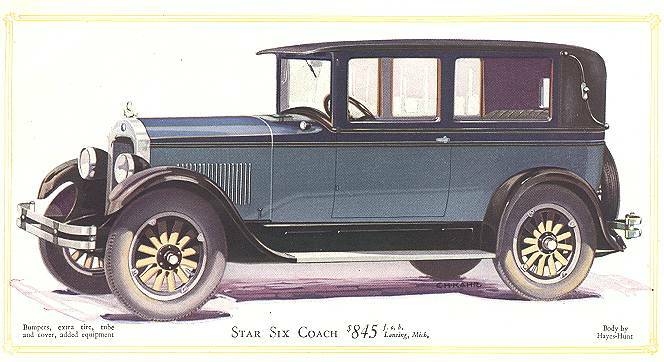 Star Six refinements, which include Hayes Hunt visor ventilators, sumptuous upholstering, rumble-proof body construction, shock-absorbing springs, ample room, indirect instrument board illumination, walnut finished interior trim on closed models, etc., create riding comfort and interior beauty unequaled in the less-than-thousand-dollar automobile field. A Star Six demonstration arouses enthusiasm because of its exceptionally smooth performance, quick acceleration, unequaled power and unusual speed. Beauty of line and finish, appointments and equipment, riding comfort, reliability and economy establish completely the all-around superiority and surpassing dollar value of the Star Six. This 40-brake horsepower motor has full-force feed lubrication to all main, camshaft and connecting rod bearings, honed cylinders, silent chain front end drive and other improvements that make it the highest quality, most powerful motor of any low-priced six-cylinder car. MOTOR, Six-cylinder, L-head type, detachable head; bore, 2 ¾"; stroke, 4 ¾"; piston displacement, 169.3 cubic inches. CYLINDERS: Cast en bloc with upper half of crankcase: detachable head. VALVES: Intake, 1 3/8"; exhaust, 1 ¼"; 5-16" lift. CRANKSHAFT BEARINGS: Front, 2 1/8" x 1 3-32"; intermediate, 2 1/8" x 1 3-32' (2); rear, 2 1/8" x 1 15-32". CAMSHAFT BEARINGS: Front 11/8" x 1 9-32'; center front, 1 13-16' x 13-16"; center rear, l 3/4" x 13-16"; rear, 1 9-16' x 1 21-32'. MOTOR LUBRICATION: Force-feed to all camshaft, main and connecting rod bearings. COOLING SYSTEM: Honeycomb type radiator; capacity, 12 quarts; 16' fan 4 blades; pump. FRONT AXLE: Standard drop-forged "I" beam section with reverse Elliot type steering mechanism , Tapered roller wheel bearings. REAR AXLE: Semi-floating, simple design, with spiral ring gear and pinion. BRAKES: External contracting, internal expanding; 11' brake drums. Easy adjustment. CARBURETOR: One-inch, plain tube, with air and fuel adjustment. Exhaust, and intake manifold with hot spot, mounted on left side of engine. TRANSMISSION: Standard selective sliding gear type, three speeds forward and one reverse. STEERING GEAR: Semi-irreversible, worm and gear type. Ball thrust bearings; l7½" walnut steering wheel. Horn button on wheel. CONTROLS: Center control; accelerator pedal mounted on toe board. Spark and throttle levers on steering wheel. Speedometer, ammeter, oil gauge and instrument lamp clustered on instrument board; choke, ignition and lighting switch mounted on instrument board. STARTING, LIGHTING, IGNITION: Generator starting motor, igniter and coil, motor-driven horn. GASOLINE SUPPLY: Capacity of tank, lly2 gallons; placed at rear. Vacuum feed. Manufacturer reserves the right to make changes in specifications or design without notice. 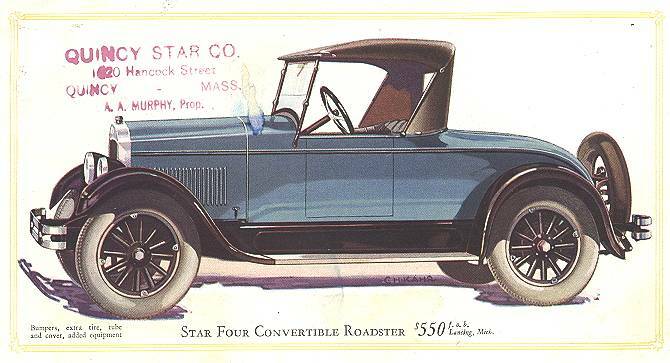 The Star Maintenance Plan, originated by Durant Motors, Inc., provides for regular inspection, lubrication and adjustment of Star Cars whose owners are enrolled in the Maintenance Club. These maintenance operations occur every 500 miles as described in Maintenance Club booklet, furnished free on request. These charges do not cover general repair work such as is necessitated by abuse or accident. However, they tend to eliminate such charges by minimizing the possibilities of abuse of the car or of accidents due to preventable breakdowns. This plan does not increase owner's service expense, but materially decreases it and lowers his average cost per mile. Every buyer of a new Star Car should enroll immediately after purchase. 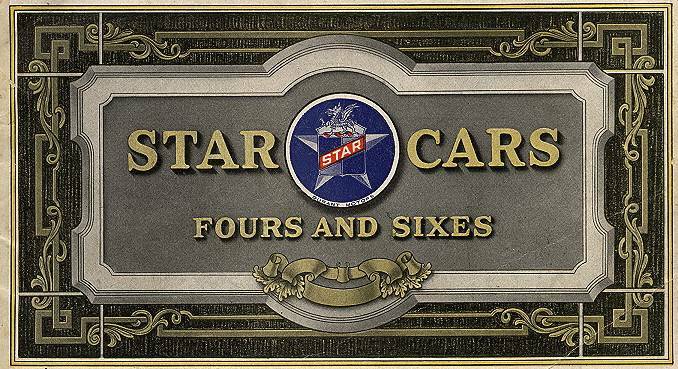 Owners of Star Cars that have been in use for some time are eligible for enrollment after their cars have been reconditioned and put in good running order at their expense. THIS system was designed to take the guess work out of Star Car repair charges. Every automobile repair job involves labor and often requires new parts. The price of Star parts is the same everywhere. The cost of labor in a repair operation varies with the wages paid mechanics, the extent of special tool equipment used and the efficiency of the mechanic. Star Car owners should not be expected to pay different amounts for the same work in different shops in the same locality. Durant Motors, Inc., Service Division, took established average cost of labor and material for each repair operation, and with these as a basis, created fair average charges for such operations for use everywhere, designed to give service station and mechanic a fair return for labor and material, and provide for the owner a reasonable repair cost. A feature of this system is that it enables the dealer or service station proprietor to establish a piece-work basis of compensation for the mechanic for each Flat Rate Operation. This fixes a definite labor cost, under which the mechanic becomes responsible for the efficiency of his work and corrects errors or oversights on his own time. This ensures careful workmanship. The owner knows in advance the exact price of any scheduled repair operation. In case the estimate of damage or diagnosis of the trouble is found to be wrong after the car unit is opened-up, the owner is advised by phone or mail of the necessary revision in the charge before the new work is started.